If you have not registered yet, please click at Create An Account (if you already have an account, please login into this account). The corresponding author should be the one creating this account. We have setup a special Abstract manuscript branching for IARC 2018 submissions. When authors select that they are submitting an Abstract (as shown in figure below) they won’t be required to submit an abstract or cover letter. 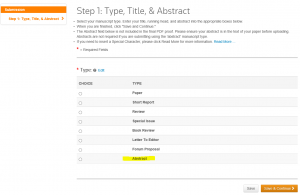 They will just have to follow the instructions, fill in the forms, and finally upload the Word file with the actual abstract and an optional figure and/or table.